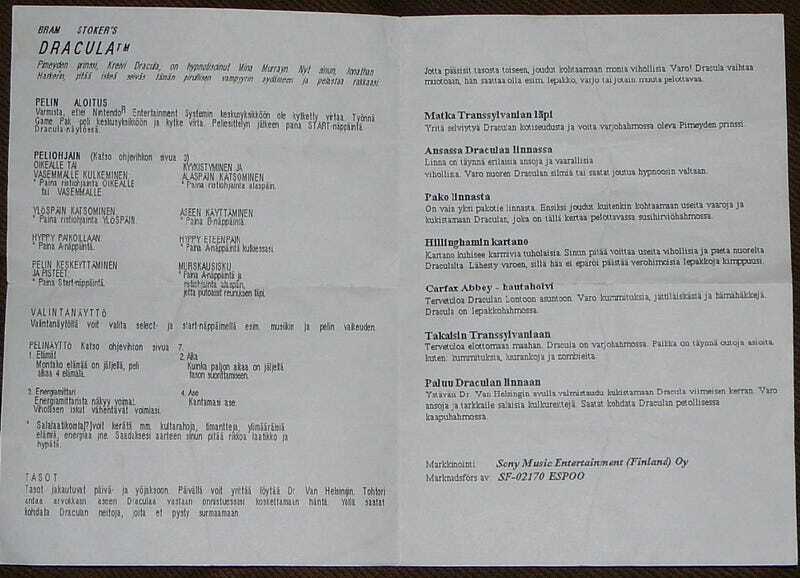 For some reason, the typed, un-illustrated manual, in Finnish, for Bram Stoker's Dracula on the NES is a very desirable collector's item. Finland's equivalent of eBay currently has a listing for one, where it's been bidded up to the equivalent of about $1,200 U.S.
NeoGAFer PetriP-TNT found the listing today, noting that the Finnish Dracula Manual is a hotly debated concept in the game collecting community. Some doubt that it even exists, which opens this listing to charges of fakery. This specific manual appears to have shipped as a supplement to the game published in German. It would seem to be an easy thing to forge, considering the basic typeface used, the absence of any illustrations, and the fact it looks like it was photocopied onto a regular sheet of paper. (An image provided shows the back with a coffee stain and some Finnish scribbling on it.) The cartridge and a worn-out box for the game is the only other visual support provided. Nonetheless, the manual has gotten about 25 bids (as of publication time) since it was listed on Jan. 11. The high bid is currently 888,88€. There's one vrk left in the auction.